Latin America’s springtime of socialism saw many nations adopt independent foreign policies, free of dictates from Washington. With the United States bogged down in military quagmires in Afghanistan and Iraq, Latin America broke free of its political, financial, and military chains that tied it to Washington. Latin America’s newly-found freedoms irritated the neo-conservatives and military brass in the United States, particularly John Bolton, George W. Bush’s Senate-unconfirmed ambassador to the United Nations, and John Kelly, Commander of the US Southern Command in Miami. Both Bolton, Donald Trump’s national security adviser, and Kelly, Trump’s chief of staff, are now in positions to aid and abet the rise of the caudillos in Latin America, getting revenge on progressive leaders and their political parties. Latin America’s progressive socialist springtime was at its pinnacle when Venezuelan President Hugo Chavez, leading a bloc of Latin American and Caribbean nations that served as an alternative to the neo-colonial and American-dominated Organization of American States (OAS), was an inspiration to other progressive leaders in the region. Chavez was the brainchild behind the creation of the non-American-controlled Bolivarian Alliance for the Peoples of Our America (ALBA) and Community of Latin American and Caribbean States (CELAC). Latin America’s springtime of socialism began to unravel after the United States – mainly via the Central Intelligence Agency and Southern Command, engineered textbook military coups in Haiti and Honduras, an attempted military coup in Ecuador, and “constitutional coups” in Paraguay and ultimately, in Brazil. After Chavez was diagnosed with an aggressive form of cancer, his Bolivarian bloc was besieged by Washington. Today, only Venezuela, Nicaragua, Bolivia, and Uruguay remain as vestiges of the progressive bloc and all are under siege, to varying extents from Washington and compliant “crony capitalist” regimes in Colombia, Brazil, Argentina, Chile, and Peru. The election as president of Brazil of Jair Bolsonaro, a far-right politician of the inaptly-named Liberal Social Party (PSL), represents a return to the days of the military-backed caudillos of Washington’s “gunboat diplomacy” days and its imposition of “banana republics” in the Western Hemisphere. Bolsonaro, a self-proclaimed admirer of Adolf Hitler, Benito Mussolini, and Brazil’s past military dictatorship, began establishing himself as a far-right version of past Latin American military dictators even before he was elected president. Bolsonaro made no secret of desiring to lead a right-wing bloc of Latin American nations subservient to the nationalist and racist doctrines of the Trump administration. Bolsonaro reached out to Paraguay’s right-wing president, Mario Abdo Benitez – whose father served as the private secretary to the pro-Nazi dictator Alfredo Stroessner – in promising to forge closer ties between Brasilia and Asuncion. Colombia’s right-wing president Ivan Duque also held talks with Bolsonaro with an eye on joining a far-right bloc of Latin American nations to be hammered out at a future Conservative Summit of the Americas, which will likely draw Mr. Trump as a participant. Former White House chief strategist Steve Bannon, busy with his plans for a summit of far-right European political parties under a Brussels secretariat called “The Movement,” has been advising Bolsonaro and his ambitious son, Brazilian congressman Eduardo Bolsonaro. Bolsonaro has also held conversations with Argentina’s right-wing president Mauricio Macri, a one-time business partner of Trump, in anticipation of forming a new right-wing alliance in Latin America. Bolsonaro received Jacqueline van Rysselberghe and Jose Durana, two right-wing Chilean senators of Chilean President Sebastian Piñera’s Independent Democratic Union (UDI), which looks fondly upon the past brutal dictatorship of General Augusto Pinochet. Bolsonaro and members of Bannon’s Brussels-based “Movement” are also advising Bolivian far-right forces led by Las Calles opposition coalition head, Maria Anelin Suarez, who is trying to oust Evo Morales from the presidency. Bolsonaro dispatched one of his deputies-elect, Carla Zambelli, to Bolivia to organize, along with Suarez, Las Calles, and Bannon associates, an October 10, 2018 “national march” against Morales. Bolsonaro indicated that his anti-Morales efforts have the support of Argentina’s Macri and Chile’s Piñera, in fomenting opposition to Morales in Bolivia. Bolsonaro has said that with him as president of Brazil, he and Argentina with Macri and Chile with Piñera will defeat “socialism” in Bolivia and Venezuela. Bolsonaro has been called the “Tropical Trump.” Bolsonaro has promised to seize the lands of Brazil’s indigenous tribes and hand them over to private businessmen for exploitation. He has also called Afro-Brazilians “obese and lazy” and people from Haiti, Africa, and the Arab Middle East the “scum of humanity.” Bolsonaro has given Brazilian opposition leaders two choices: exile or execution. 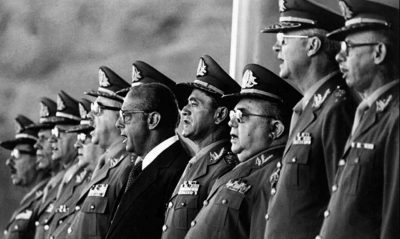 There is a strong possibility that Bolsonaro, Macri, Piñera, Abdo Benitez, and Duque will seek a revival of OPERATION CONDOR, a CIA-encouraged alliance of the secret police and intelligence agencies of Latin American military dictatorships that existed from 1968 to 1989. CONDOR, which had the blessing of US Secretary of State and national security adviser Henry Kissinger, was responsible for tracking down and assassinating leftist leaders that had taken refuge in Argentina, Bolivia, Brazil, Chile, Ecuador, Paraguay, Peru, the United States, and Uruguay. Bolivia, landlocked by right-wing governments in Brazil, Argentina, Paraguay, and Chile, and a Washington compliant Peru, will face mounting political, economic, and military pressure to deny Morales a fourth term as president in 2019. Venezuela, already paralyzed by economic sanctions imposed by the Trump administration, will see Brazil and Colombia allow their border regions to be used for CIA-supported paramilitary operations against the government of President Nicolas Maduro, Chavez’s chosen successor. Ortega’s government in Nicaragua will also continue to be subjected to destabilization efforts mounted by the CIA, with the support of Bolsonaro’s government in Brazil. Only the incoming progressive left-wing government of Andrés Manuel López Obrador (AMLO) in Mexico and Cuba will be able to help the few remaining pockets of left-wing populism in the Western Hemisphere to survive. The rights of workers, peasants, indigenous peoples, students, and non-evangelical clergy in Latin America will soon come under assault in a manner not seen since the days of the caudillos, juntas, and CONDOR. “Lula,” who remains the most popular political leader in Brazil, has been incarcerated in prison for 12 years on trumped up charges brought by a right-wing judiciary and legal apparatus. The hemisphere must now look to AMLO; Cuba’s post-Castro president, Miguel Díaz-Canel; Uruguay’s former president Mujica; and the remaining progressive prime ministers of the English-speaking Caribbean states to rescue the leaders of Bolivia, Venezuela, and Nicaragua from the impending fascist onslaught. Mujica has warned that Bolsonaro’s election represents the same sort of mentality that saw Hitler elected in Germany. Mujica said, on the eve of the Brazilian election, that “humans have little memory. By clamoring for change, one can move to the worst.” Latin America and the anti-Trump opposition in the United States must be on guard against a new fascist Axis-like pact led by Bolsonaro, Trump, Macri, Duque, and fellow-travelers, such as Guatemala’s comedian-turned-fascist president – Jimmy Morales – and Honduran banana republic dictator Juan Orlando Hernandez.